Thank you for visiting the Duracell website. 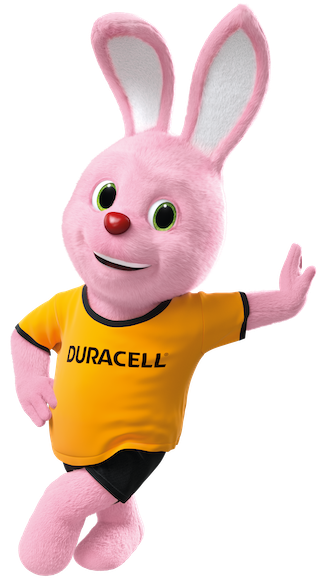 The controller of this website is Duracell international Operations SARL, a Swiss company with its registered offices at 1, route du Pré de la Bichette, 1202, Geneva, Switzerland. The European Union General Data Protection Regulation. The European Model Clauses regarding the collection, use, and retention of personal data from European Union member countries and Switzerland. We may collect information directly from you when you voluntarily choose to participate in our offers, promotions and competitions, all or email us, or otherwise provide information directly to us. Product development, customer management, testing, improvement and troubleshooting: For our legitimate interests in securing and protecting the integrity of this website, and for website and product development. When we receive your explicit consent to collect tracking information via cookies, we also may use viewing data to analyse how visitors use the website in order to provide statistics and improve the experience of interacting with the website. See hereunder for more information in this respect. As permitted to meet applicable legal obligations: we may pursuant to valid legal process, such as a search warrant, subpoena, or court order, allow access to any information (including such categories of personal data) provided to Duracell, in order to comply with such process and to protect our rights and property. If warranted, we may also allow access to this information in special emergencies where physical safety is at risk. To the extent necessary to perform a contract or take steps to enter into a contract with you, for purposes of customer and contract management. A cookie is a small piece of data that a web site can send to your browser, which may then be stored on your hard drive as a “tag” that identifies your computer. Cookies can allow us to properly format the web page on subsequent visits for your specific computer and browser, letting us personalise your experience and tailor our inter­actions with you. Cookies also help us to gather anonymous statistics about usage and effectiveness of our site. The success of our business depends on your trust, and we do not sell your personal data to marketers outside of Duracell. We do not share personal data with marketers outside of Duracell. We may rely on third-party service providers to perform a variety of business operations on our behalf. In so doing, we may need to share your personal data with them. We will then provide our service providers with only the personal data they need to perform the services we request. These services are carried out for the business purposes described in paragraph “Purposes of processing & legal grounds” of this policy. We enter into written contracts with our service providers, and we require that they protect this information and not use it for any other purpose. Host our websites and deliver our communications. Conduct research and analyse data to improve our products, services and websites. We share aggregated and/or anonymous information that does not identify you for Duracell business purposes. For example, we may disclose the number of visitors to Duracell websites or services. We may also share aggregated and/or anonymous information with our business partners for their own business purposes. Your personal data may be transferred and stored outside your place of residence, that are subject to different standards of data protection. Duracell may transfer your personal data within Duracell and/or to other third parties, such as our third-party service providers. This may include the United States. When we do so, we transfer the information in compliance with applicable data protection laws. We have implemented procedures and controls to help ensure that personal data is protected no matter what country it is stored in or transferred to. You have a right to contact us for more information about the safeguards we have put in place, including a copy of relevant contractual safeguards, to ensure the adequate protection of your personal data when this is transferred as mentioned above. by writing to the address provided in the Contact Duracell section below. We take reasonable steps designed to keep your personal data accurate. However, we rely on you to provide accurate and complete information and inform us of any changes. Request correction of any incomplete or inaccurate personal data that we hold about you. Request erasure of your personal data when there is no need for us continuing to process it or you have exercised your right to object to processing (see below). Request the restriction of processing of your personal data to suspend the processing, for example if you want us to verify its accuracy or the reason for processing it. If you want to exercise any of these rights, please submit your request to the contacts named in the Contact Duracell section of this Privacy Statement. Valid requests will be honoured within one month of the request. This one-month period may be extended for another 2 months for complex requests with notification of the reasons for the extension to you. You will not have to pay a fee to access your personal data (or to exercise any of the other rights). However, we may charge a reasonable fee if your request for access is unfounded or excessive. Alternatively, we may refuse to comply with the request in such circumstances. In addition, there may be requests that we are unable to process because of other EU legal requirements. If a request is denied, we will notify you of the reason. We may need to request specific information from you to help us confirm your identity and ensure your right to access the information (or to exercise any of your other rights) and ensure that personal data is not disclosed to any person who has no right to receive it. Duracell is committed to keeping personal data secure. We have implemented technical, administrative and physical procedures designed to protect personal data from loss, misuse or alteration. Unfortunately, the transmission of information via the internet is not completely secure. Although we will have taken measures to protect your personal data , we cannot guarantee the security of your data transmitted to our site; any transmission is at your own risk. Once we have received your information, we will use procedures and security features designed to try to prevent unauthorised access. We do not intend to collect personal data online from children under the age of 16 or as defined by local legal requirements, except on sites specifically directed to children. On those sites, additional transparency requirements are applicable and observed.